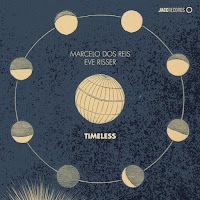 The first meeting of French pianist Eve Risser and Portuguese guitarist Marcelo dos Reis is a journey with and within strings, many and strange kind of strings (borrowing the title of Sun Ra's seminal album). Both Risser and Reis employ unconventional strategies that extend the sonic palette of the piano keys and its metal strings and the acoustic guitar's nylon strings, preparing their instruments by attaching various objects to their strings. Risser and dos Reis already established themselves as improvisers who like to experiment with sounds, textures and formats. Risser who also plays the harpsichord, blurred the distinctions between new music, composition and improvisation with her White Desert Orchestra and explored song formats with the free-improvising The New Songs quartet. Dos Reis has collaborated with like-minded experimental improvisers such as Elliot Sharp, Toshimaru Nakamura and Andrea Neumann, plays in a duo with harpist Angélica V. Salvi and in the free jazz meets free-improvisation groups Fail Better!, Chamber 4, and Pedra Contida. Timeless was recorded at Jazz ao Centro Festival, Coimbra, Portugal in October 2016. The seven pieces are titled after different artifacts, devices and seasons that measure time, but these free-associative improvisations actually consciously do not surrender easily to any sense of time. Risser and dos Reis flow with the sounds and explore their infinite spectrum. Both focus on shaping and sculpting their resonance and friction qualities until you are lost in sonic turbulence and can not tell any more who does what. Risser and dos Reis at times sound as incorporating ideas from the minimalist compositions of Morton Feldman, blended with Japanese ritual koto traditions as on the enigmatic-exotic “Hourglass” and “Balance Spring”. Other pieces stress the resourcefulness of both as highly imaginative improvisers. “Water Clock” shifts instantly from a leisured, mysterious soundscape to an urgent and intense free-improvisation and “Timewheel” offers an even denser and tougher version of such free-improvisation. “Chronometer” is the only piece that suggests a melodic-playful vein and the dense commotion of “Pendulum” even hides a lyrical theme. Timeless offers a rare kind of beauty.